Our Single Queen Glamping Tent is a 14' x 16' canvas wall tent set on furniture-grade redwood. This is glamorous camping to be sure! The queen size bed includes luxury linens and a down duvet. 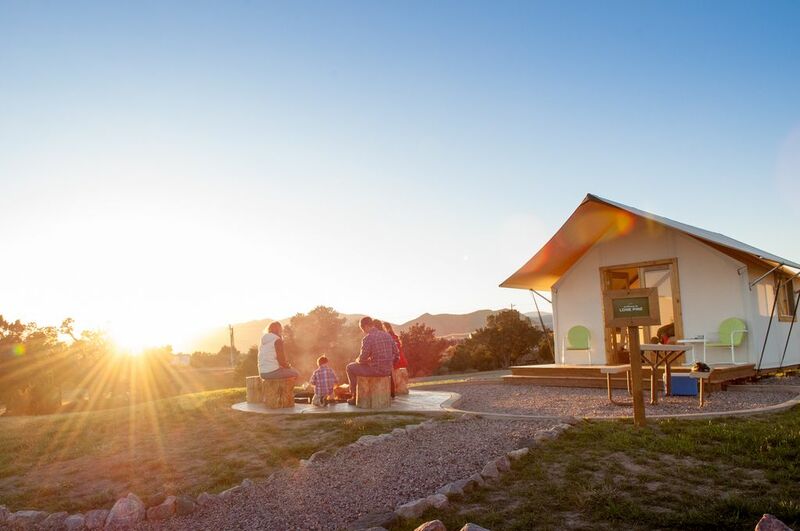 Glamping tents include a desk, night stands, a couch, high speed wireless internet, multiple power outlets, and designer bath products for use in the community shower house just steps away from your tent. Each tent also includes a private 4' x 6' wood deck, along with a private campfire ring and picnic table. Every night a fire will be prepared for you so all you have to do is strike a match and enjoy your crackling fire under a starry Colorado sky. Single Queen Glamping Tents have a maximum occupancy of 2 adults. Royal Gorge Cabins is located just far enough in the Rocky Mountains to offer an authentic Colorado experience, yet close to a variety of exciting outdoor adventures and attractions. Located just one hour from Colorado Springs and minutes outside of Cañon City, the focus of our cabins is on providing you a one-of-a-kind lodging experience. toilet, shower, Bathroom is located in shared shower house. Luxury linens, pillows and down duvet provided. Fire ring with cooking grate. Seating is provided around the concrete patio surrounding the fire ring. Picnic table is located outside on private patio area.